Kylie Minogue touched down in Australia yesterday, and rushed straight to her sister’s side to meet her ‘scrumptious’ new nephew, Ethan. SEE DANNII’S STYLE HISTORY HERE! Dannii gave birth to baby Ethan Edward Smith two weeks ago, but Kylie missed the big event after being trapped on a promotional tour for her latest album, Aphrodite. But the excited new auntie jetted out to Aus at the earliest opportunity, and her first meeting with the tot and his proud parents yesterday. The star is said to have arrived clutching presents for baby Minogue, and judging by her reaction, the pop princess is already smitten with the bouncing boy. Dannii quickly followed suit, Tweeting: ‘Auntie Kylie meets Ethan!’ to followers shortly after her sister’s arrival. 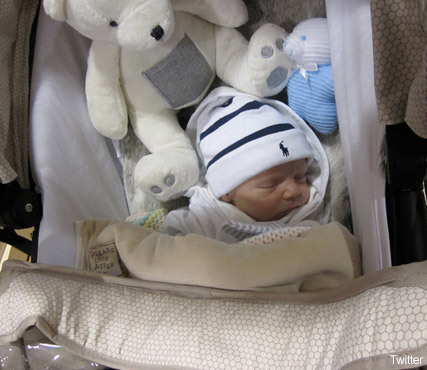 Gorgeous baby Ethan had his first ever outing just the day before, when he, Dannii and Kris hit Mothercare to shop for some tiny goodies. ‘Sleeping peacefully, Ethan was amazing as always today…… Such a good boy just like his dad ;-)’ Kris tweeted after their spree. This week, Dannii has also confirmed via Twitter that she’ll be back for the ‘judges’ houses’ stage of the X Factor. Admitting she and Kris are ‘so proud’ of their little one, Dannii told followers she had invested in some baby Uggs for winter, and may even be bringing the tiny tot along to X Factor auditions. So he may be making his TV debut sooner than we thought!